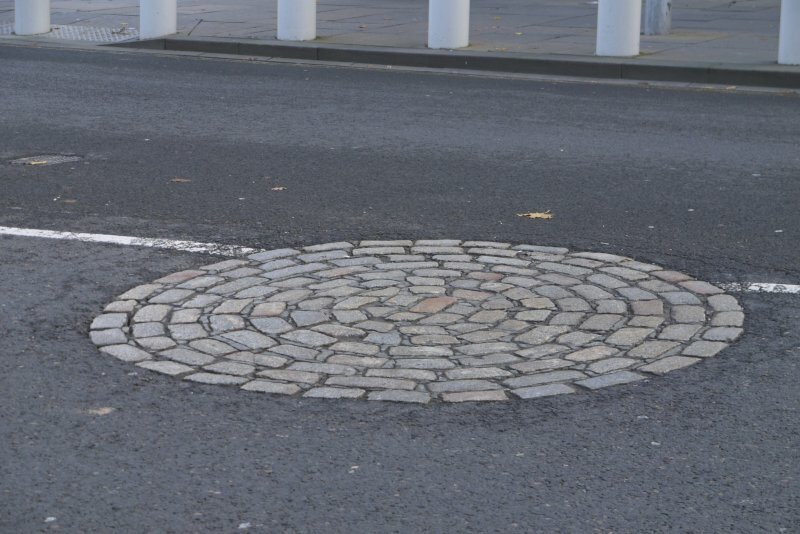 Detail of circular cobbled marker for former site of Girth Cross, Canongate, Edinburgh. The Girth Cross, which has also been called the "Abbey" or "South" Cross at various times, marked the W limit of the Girth of Holyrood, the greatest sanctuary in Scotland, and the last to disappear. It is shown on a map of 1573 as an ornamental shaft elevated on a flight of steps and was extant until after 1767. RCAHMS 1951; H Hannah 1927. Visited by OS (J L D) 25 December 1953. See NMRs Historical File, under The Canongate - The Girth Cross. Entry consists of one page of information with two pen ank ink sketches showing the Cross and the pattern of paving blocks that is said to mark the position of the Cross. In the frame room is Gordon of Rothiemay's Map, 1647.